Lisa is well known to Netball NI as a senior team player, performance coach and more crucially when working as the Everybody Active 2020 coach for the Antrim and Newtownabbey council area. Lisa has a lot of experience setting up and coaching schools programmes as part of this post and has continued to use monitoring and evaluating tools as part of her role as Project Co-ordinator at Superstars, the organisation she will be leaving to join the Netball NI team again. 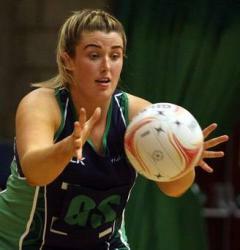 Lisa also understands the club environment with being chairperson of Spires Netball Club. Tom Causer, Club and Workforce Officer for Netball NI commented on the new appointment, “Lisa was a very strong candidate demonstrating a good knowledge of the role, mainly being that of co-ordination and organisation. Lisa has a thorough understanding of netball structures with the skill set to increase schools participation, strengthen the school to club link and improve the education offer to teachers. Lisa begins the position on the 2nd May 2019 and will attend the Schools AGM on the 8th May 2019 as way of an introduction to the Schools Committee. Lisa will meet Tom Causer in the first few days to discuss the performance measures for the post which include increasing the numbers playing in schools, increasing the number of school players moving into affiliated junior clubs and improving the number of teachers attending our coach and officials education courses.